* Upload image(s) of the area you would like a water feature or picture(s) of your current water feature. By submitting the form, you agree it's okay for us to share your info with a nearby Certified Aquascape Contractor who will be in touch with you to schedule your consultation. 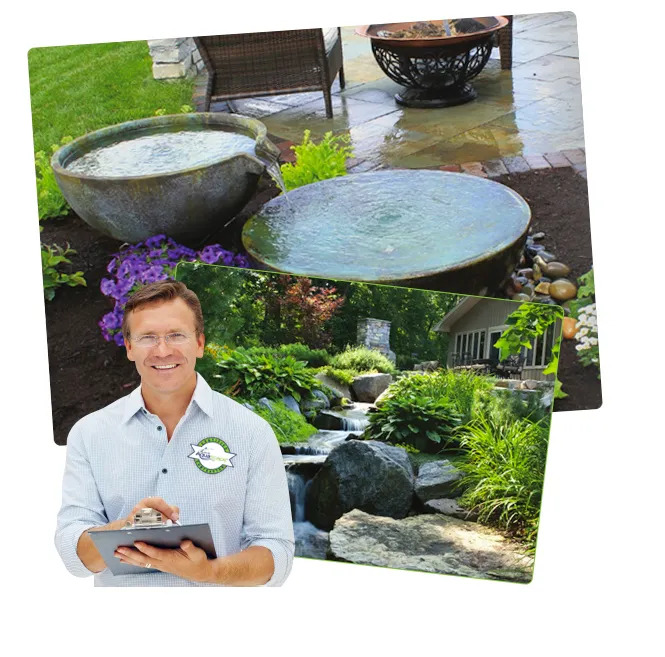 Schedule an in-person consultation with a friendly Certified Aquascape Contractor and discover how a water feature will enhance all the ways you enjoy your yard. When you’re ready to get your project started, we recommend working with a Certified Aquascape Contractor (CAC). Our pre-qualified certified contractors are the best pond builders in the business. We make sure of it. They’re experienced and expertly trained by us in designing and building beautiful ponds, waterfalls, fountains and more. And of course, they care as much about happy customers as we do. Transforming your dreams into backyard reality takes some planning and our certified pond builders are ready to help. During a 1-2 hour backyard consultation, we look forward to meeting your family, getting to know you, and understanding what’s most important. In exchange, you’ll get personalized recommendations and a clear vision of your project. The Certified Aquascape Contractor (CAC) is familiar with the installation of Aquascape’s products. The CAC is not an employee, agent, or in any other way associated with Aquascape, Inc. Any agreement or contract you reach with the CAC is solely between you and the CAC. Aquascape, Inc. has no responsibility for, nor does Aquascape insure or guarantee in any way the performance of the CAC.